Using Goreclaw to great effect, Joao Choca mauled all opposition in M19 Limited, including Michael Kundegraber in the finals, to become champion of Grand Prix Turin 2018! THE HASHTAG FOR GRAND PRIX TURIN IS #GPTURIN. JOIN THE CONVERSATION. 1,032 players on Saturday. 221 after the Day 2 cut. Eventually eight players in the feature match area for the final Booster Draft. Then two players to duke it out for the fame and the fortune, the title and trophy. Core Set 2019 Limited had shown itself to be an interesting format all weekend long. In draft especially, aggressive decks had done very well. So it was only logical that two such decks would meet in the finals. On paper, Joao Choca's mostly green deck full of fat looked as if it might be too slow for Michael Kundegraber's double Heroic Reinforcements. On the battlefield, however, it looked anything but slow, as Goreclaw, Terror of Qal Sisma sped things up enough to win any race. 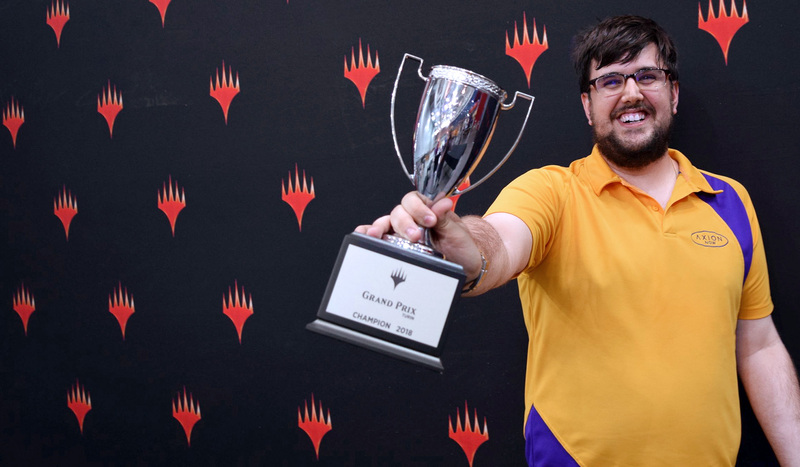 Congratulations to Joao Choca, champion of Grand Prix Turin 2018! These four would enjoy a head start over the competition in Sunday's Booster Draft rounds, but said competition was tough too. Just at 8-1, one could find Louis Deltour, Francesco Giorgio, Fabrizio Anteri, and Rosario Maij, all with multiple GP Top 8s already on their record, to name but a few. It was going to be an exciting race to the top on Sunday. Check back then for further news and stories, for draft insight and decklists, and for the epic conclusion of Grand Prix Turin 2018!